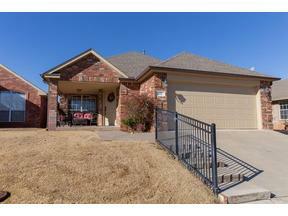 Immediately you will notice the curb appeal of this 3 bed 2 full bath home in the heart of Edmond! The spacious kitchen has a large amount of cabinet space for the at-home chef and two skylights that floods the room with natural light. The large living room has a fireplace along with vaulted ceilings that make the space feel bigger and hardwood throughout the home. With a big open floor plan, you are able to look into the beautiful dining room with another skylight and a spacious laundry room that leads into the 2 car garage. Dining room would make a great office, study, or game room! This home has an extra large master suite with double vanities, whirlpool tub, walk in closet, and a door leading to the back covered patio. HOA takes care of all lawn maintenance so you will have lots of spare time! With Edmond schools and being located less than 1 minute from I-35, 5 minutes from Lake Arcadia, and 9 minutes from UCO.